For availability, please see our Stockists page. You can purchase all our products direct. This luxurious syrup is made only from apples grown in our Dorset orchards – there’s no added sugar or sulphites. Concentrated, rich and versatile, it works brilliantly with pancakes, yoghurt, porridge, icecream, or French toast. Mix with sparkling water or lemonade to make a non-alcoholic summer cup, or use as a sweetener in cooking. Recipe suggestions here as well as ways of using the Syrup in cocktails. We make our vodka by carefully combining the juice of the heritage apple, Porter’s Perfection, with neutral wheat grain spirit, before distilling, and then adding botanicals and local spring water. This results in a really smooth, clean vodka, with a very subtle taste of apples when served neat over ice. We use Porter’s Perfection apples, a rare local heritage variety first identified in 1905, partly because their distinct taste beautifully complements the vodka, and partly because we feel it is so important to find modern uses for the rarer heritage varieties. Using them in this way helps ensure their survival in the future – we have planted 38 and have just grafted another 24 trees in our orchard. It creates an incredibly refreshing vodka and tonic when mixed with a Mediterranean tonic, which allows the apple taste to come through. Serve with a slice of fresh ginger and apple, or use to make a fabulous cocktail. Alc 40%, available in 70cl, 35cl or 10cl bottles. More information here. The 6 year old apple balsamic vinegar is made using the traditional Italian method of reduction and concentration of the juice over a lengthy period of time (rather than by adding flavouring and colouring). The only ingredient in our balsamic is apples which have been grown in Dorset and Somerset orchards. The longer the ageing process, the more concentrated and intense the flavour. We are currently bottling our vinegar once it has been aged for 6 years, but as the barrels age, we will be selling older vinegar as well. It has a rich, intense taste, with a real depth of flavour. As well as using on salads, it’s a great partner for grilled meats or charcuterie; a drop brings out the taste of strawberries and other soft fruits; and it can really enhance a stew, sauce or a soup. See our serving suggestions, and let us know how you use it. 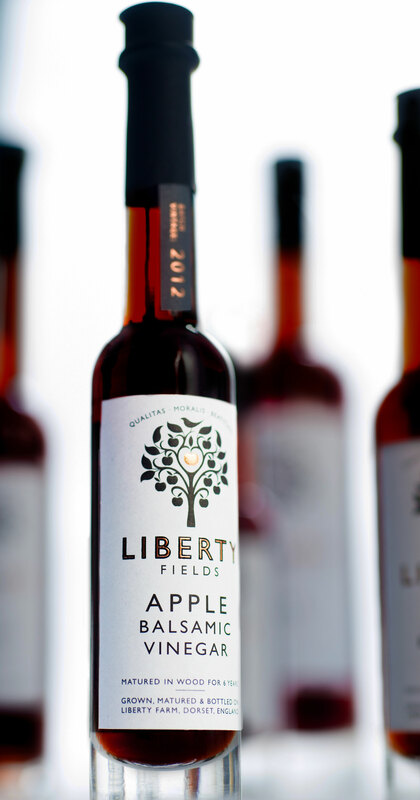 Liberty Fields Dessert Cider (previously known as Apple Aperitif) is made from heritage apples grown in our orchards. The juice is fermented and then matured for six months in oak barrels, before bottling. Want to know what it’s all about, what it tastes like and what to do with it? Read this Vinspire UK Review . Dessert Cider has a full-bodied flavour reminiscent of baked apples. Despite its full taste, it is quite low in alcohol – at 7% it’s considerably less than a glass of wine. Served chilled before you eat, but it also goes well with mince pies and fruit cake, or with a plate of cheese after dinner. Try serving it with ice (think of chilled sherry) in the summer, at room temperature in the winter, or mixing it with gin and lemonade (1 part gin, 2 parts Dessert Cider, 3 parts lemonade) for a long summery drink. Try it with vodka or brandy too! Take a look at our Serving Suggestions for more ideas, or the Cocktail recipes. There are also some great low-alcohol options.